Hmmm, how to describe this place... one word, three letters. This is a place I really want to come back to. These are the ideal coconut islands, surreal in their beauty, magnificent in their seclusion, and simply the best little mounds of sand I have yet visited. Suvarow is the kind of place one dreams about, but never really finds. We left Bora Bora on a clear sunny day, and with the exception of catching a five foot sailfish, the 700 mile passage was uneventful. We had light winds most the way, just a few rain squalls, and all in all it was a very pleasant sail. When we arrived, there were three part-time residents living on Anchorage Island. One of them is Papa Ianne, also known as Papa John. He, is 73 years old, climbs coconut trees using nothing more than a strip of burlap, can free dive 60 meters (no kidding) and regularly gathers enough fish, crabs, and lobsters to feed the hungry packs of cruising sailors who come to visit him on this paradisical pile of coral. Baker is his cousin who helps with the cooking and entertaining, and Toto is Papa John’s grandson, who spends most of his time playing with the yachties and listening to compact discs on his walkman. These three men live in Suvarow for six months of the year, during the cruising season when yachts stop off on their way from French Polynesia to Samoa and Tonga. We arrived on a clear and breezy afternoon, surprised to see more than a dozen boats anchored in the lee of Anchorage Island. Some were friends we had met in our travels and some were new faces. All of them made us feel welcome, as they had been welcomed upon arrival. Suvarow is one of the Cook Islands, and the entire atoll is designated as a national park. Coconut trees, pandanus, breadfruit trees and a few struggling banana plants account for the green stuff, the rest is sea, sand, and rocks. 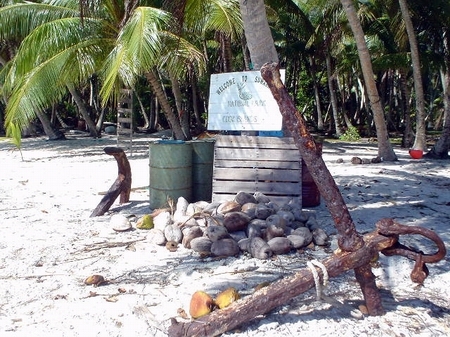 It is a nesting ground for boobies and frigate birds, and a large population of giant coconut crabs and rats make up for the lack of people. Underwater, the atoll is a seafood supermarket featuring everything yummy you can imagine, unspoilt and abundant. We only stayed two days here, although I would have liked to stay for months. Our first day we spent resting, and in the afternoon we were invited to a tea party on Alley Cat, a large catamaran with a diverse and international crew. Our second day, we went ashore with a chocolate cake for the guys on the island. I also gave each of them a beaded bracelet I had made. I wasn’t expecting anything in return, I just wanted to be friendly, but Toto gave me a mother-of-pearl fish hook pendant, Papa John gave me a recording of his original music on a CD, and Baker gave me a beautiful black pearl pendant. I was awestruck once again by the generosity of the Polynesians. One of our neighbors in the anchorage was in desperate need of a sailmaker, both his head sails and his mainsail sail had blown out, torn from luff to leech, and he was going nowhere without some major repair work. Good neighbor (although somewhat mercenary) that I am, I spent most of the daylight hours repairing his sails. Imagine earning money in a place so far from civilization, in such magnificent surroundings! I was glad to help him out, and ecstatic about earning some money. Our second and last night on Suvarow, Papa John hosted a dinner party for all the sailors in the anchorage. There were coconut fritters, mashed breadfruit in coconut milk, giant crabs, fresh sashimi (raw) tuna salad, fried fish, and of course, rice. There was more food than we all could eat, and with the exception of the rice, and an onion in the tuna salad, all that food came from the island and its surrounding waters. After dinner, Papa John played his guitar for us, and Baker played the tambourine. They both sang, and I gotta tell ya, it sounded like cats being strangled, but they were having such a good time! Their joy and pleasure spread like wildfire through us sailors, and before long, we were all singing and dancing and whooping it up! While we were there, Baker seriously proposed marriage to a pretty blond British girl, promising her all his wealth and her pick of houses to live in. Baker is about five feet tall and weighs over three hundred pounds. He has no teeth, and speaks very little English. Poor Angie didn’t want to hurt his feelings, but she politely declined, and Baker soon switched his attentions, and flashed his beautiful smile at Elsa, another young blond girl. Elsa stopped poor Baker dead by telling him a little white lie; that she had a husband and six children at home in Belgium. Toto wandered through the crowd with his headphones on, seemingly in a daze and drinking whatever was offered to him, and Papa John just sat on his hand-hewn chair and sang his off-key songs with a contented smile, Chief of the island, Commodore of the Yacht Club, Master of Ceremonies, loved and envied by one and all. We left the following day to the surprise of everyone. No one, absolutely no one stays only two days on Suvarow! Its just too wonderful a place! Its so laid back, that although Baker acts as immigration officer, you get to stamp your own passport! Papa John promised to show the ladies how to make and bake the breadfruit, and share his secret sashimi tuna salad recipe. Also, he was going to show us all how to climb the coconut trees, catch coconut crabs, and how to weave a basket to carry the coconuts and crabs home. Toto was going to teach us how to spear fish while wading knee deep in the shallows. I would have liked to stay longer and learn all these things, but the weather was really great for continuing our sail on to Samoa. Also, we had mail waiting for us in Pago Pago and didn’t want to leave it for too long. I wrote the words to this song on the passage between Suvarow and American Samoa. Perhaps someday I will return to Suvarow and sing it for Papa John. The words are mine, well, some of them anyway, with a bit of plagiarizing from the Beach Boys. Oh, and I stole their melody too. Cooks, Fiji, Samoa, you and me. in the Cooks called Suvarow. Tuvalu, Gilberts and Tonga too.